Let me remind you that on one side of my balcony is a turret. See it on the left? 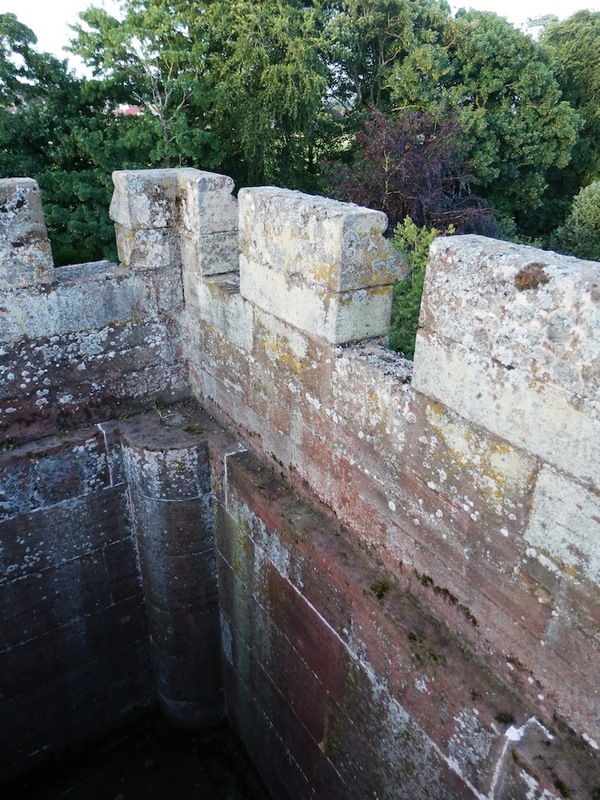 Now by climbing up the staircase within the turret and walking across Pat’s own top balcony, then mounting a few stone stairs, one comes to the water tower. An unusual feature this and it has come to fascinate me as the residency has gone on. Each of the exterior sides of the tower has a sun-dial carved into the sandstone, but the main feature is the interior. It was built under Patrick Allan-Fraser’s direction in 1869, as far as I can work out. It’s no longer in use. Well, I say that, but on the night of the soiree held in my room in the first week of the residency, we did make use of it for a party game. My idea was that we would draw straws and that he or she who drew the shortest straw would have to lower themselves into the dry water tower. Now, there’s no easy way out of the stone cube, but the rest of the group would help whichever of us drew the short straw to get out of the trap by making use of objects (a chair, for example) from my room. In the end, James Langdon voluntarily got into the space, thinking he would be able to get out by his own devices. He ran, jumped, got a grip of the top edge, then slid back down again. Poor James tried and failed many times to get out, but he would not ask for help, so what could we do but watch? Eventually, he succeeded in getting his arm sufficiently over the top row of stones in order to get some purchase. Slowly he pulled his body up and when he managed to gain an effective grip with his left arm as well, he was soon out. I expect Patrick observed the fun and games from the one higher spot in the building, that is the top of the tower that links the gallery to the original part of the house. 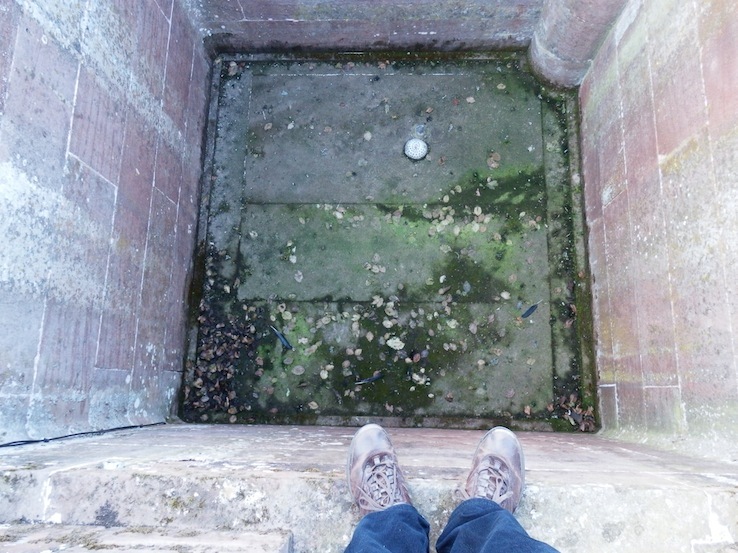 The Book of Hospitalfield tells us that Patrick was aware that there was a source of water under his estate and that by sinking a well, building a pumping house and using a hydraulic lift to get the water up into the water tower, he would have a reliable water supply for Hospitalfield. Unfortunately, the book only mentions that the well was to the south of the house. But where, exactly? I scouted around the walled garden. Maybe the fernery? 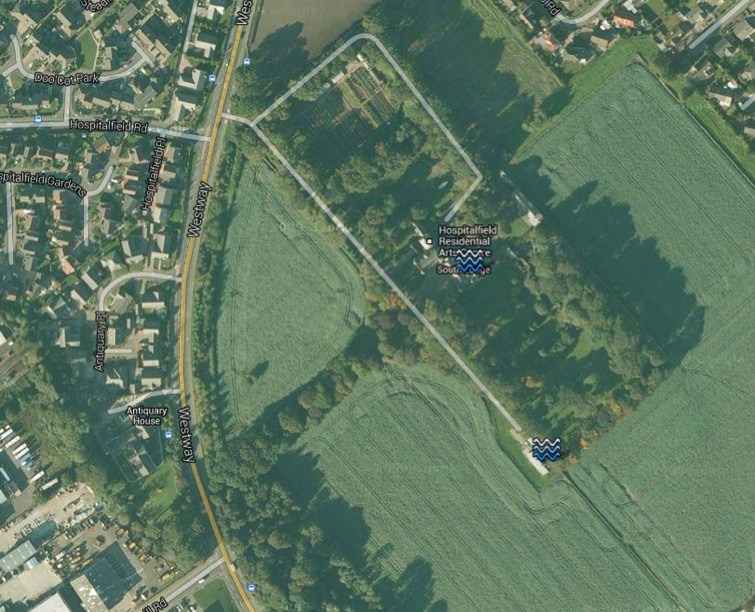 I looked further afield in the paddock. Sam Donnelly reported a well of sorts near the stables, but that is to the north of the house and, when I inspected it, seemed too small a thing. So I did the sensible thing and emailed William Payne. Willie told me that the well was underneath the house that had been built for the director of Hospitalfield during his tenure. And that the gable wall of the old pumping house could still be seen adjacent to the director’s house, an integral part of the paddock wall. If the above gives a view of the corner of Hospitalfield in question, the Google satellite image below shows an overview of the water works that Patrick masterminded. The well and the pumping house are represented by the water symbol towards the bottom edge of the image, while the water symbol located at the south-eastern edge of the main building itself represents the water tower from where water would flow throughout the house making use of gravity. What set me off on this trail was something I stumbled on in the archive. A letter dated 25th October, 1870, from Patrick Allan-Fraser to the editor of The Arbroath Guide, where the letter appeared a few days later. 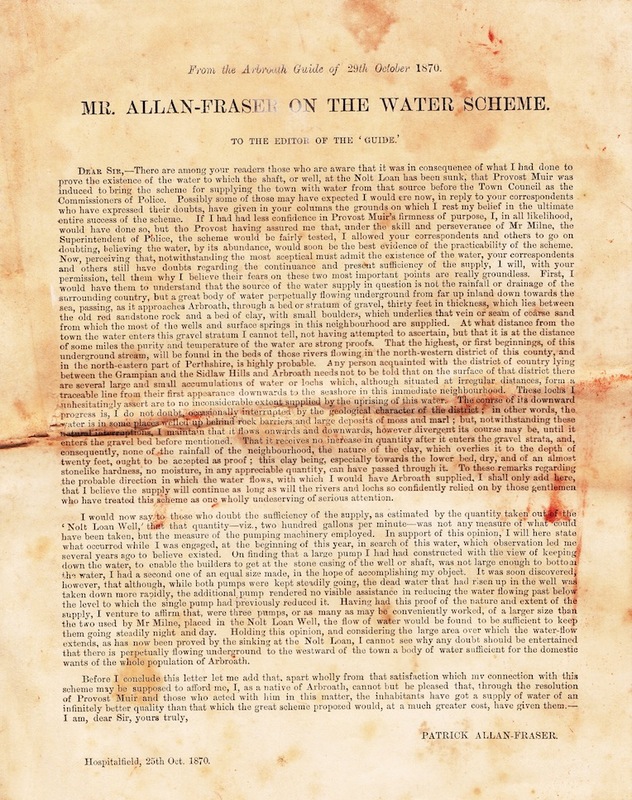 The headline used above the long letter was ‘Mr Allan-Fraser on the Water Scheme’. I’ll place a scan of the letter below, then bring out the letter’s main points underneath. 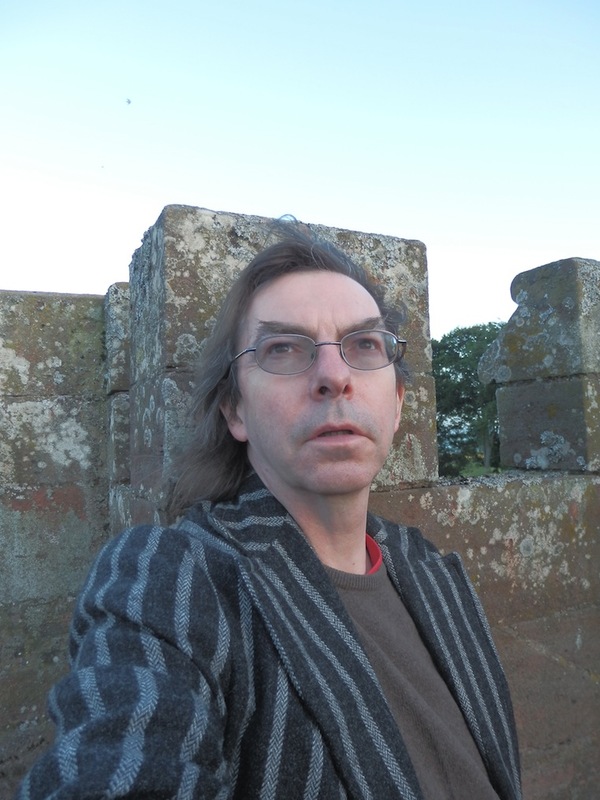 Basically, Pat’s saying that, earlier in the year of 1870, having succeeded in finding a reliable source of water for his own property, he feels he can confidently guarantee the same for the town of Arbroath. 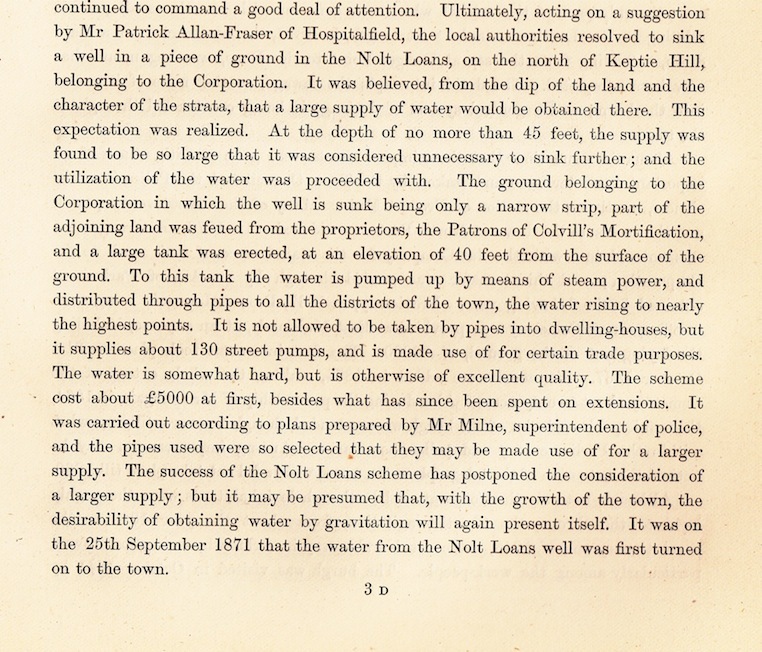 He has discovered that there is so much water underground, having made its way from the Grampians in the west through a stratum of gravel, that all that is required from the town council is to sink a well, like his own, in the Nolt Loan area. And that’s what happened. 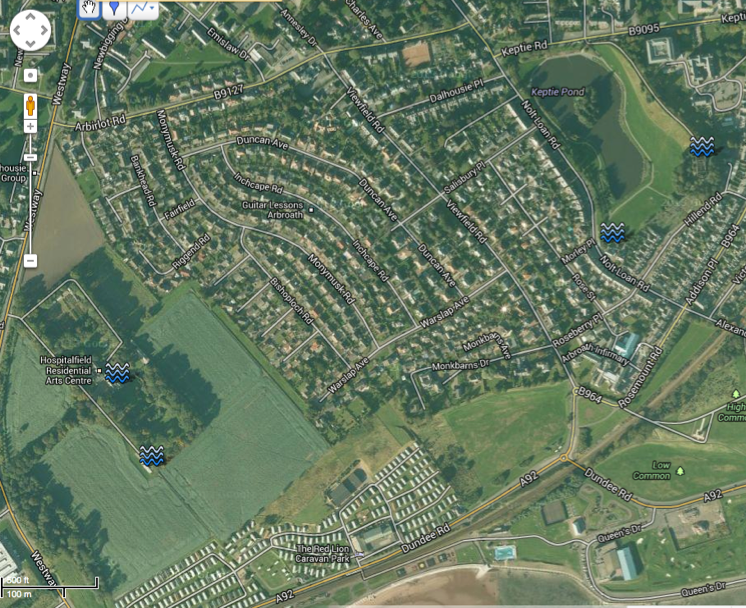 Google shows the whereabouts of the well and pumping station (the water symbol to the south of Keptie Pond) and the huge water tower (the water symbol near the right-hand edge of the satellite view). Although the Nolt Loan Scheme, as it was known, is not far east of Hospitalfield, the land at Keptie Hill and Nolt Loan did not belong to the Frasers. So that is another clue to the boundary of the estate in the Nineteenth Century. 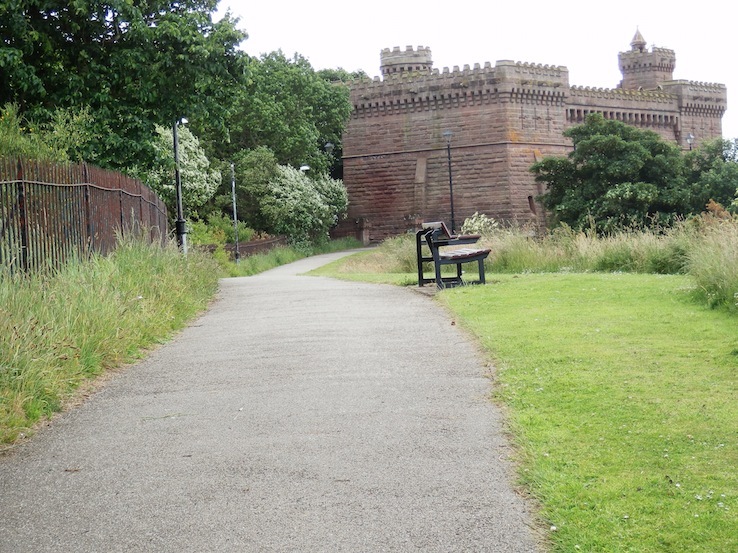 Anyway, I walked to the local landmark and as I approached the castle-like tower I took the following shot. 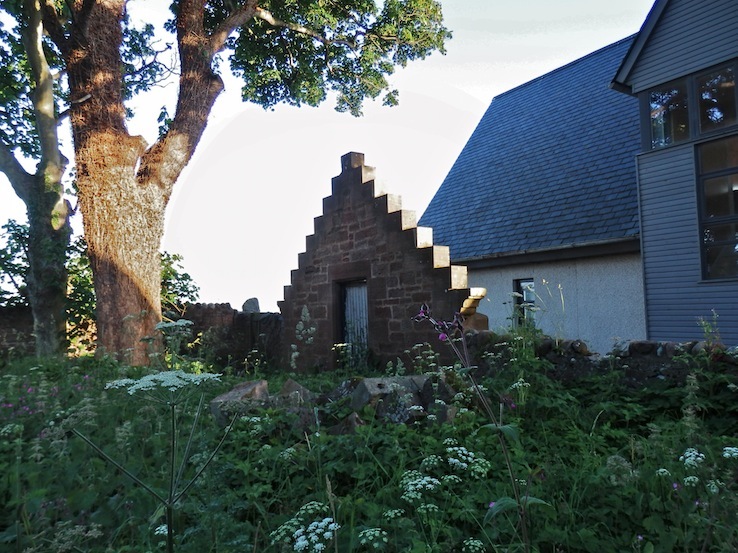 Was it deliberately designed to remind one of the architecture of Hospitalfield, standing less than half a mile away? Eagerly I read the metal placard which adorns a pillar in front of the water tower. I’ll place a photo of it below, which you may be able to decipher, but I can tell you right now that Patrick Allan-Fraser does not get a mention. The police board get a mention. The owners of the land get name-checked twice. The architects are given their due. But no PAF. Puzzled, I walked all around the structure. Unfortunately, it’s boarded up and there is no access to the interior for the general public. At the southern end of the building there is another placard, the same as the first but affixed onto the wall of a turret. 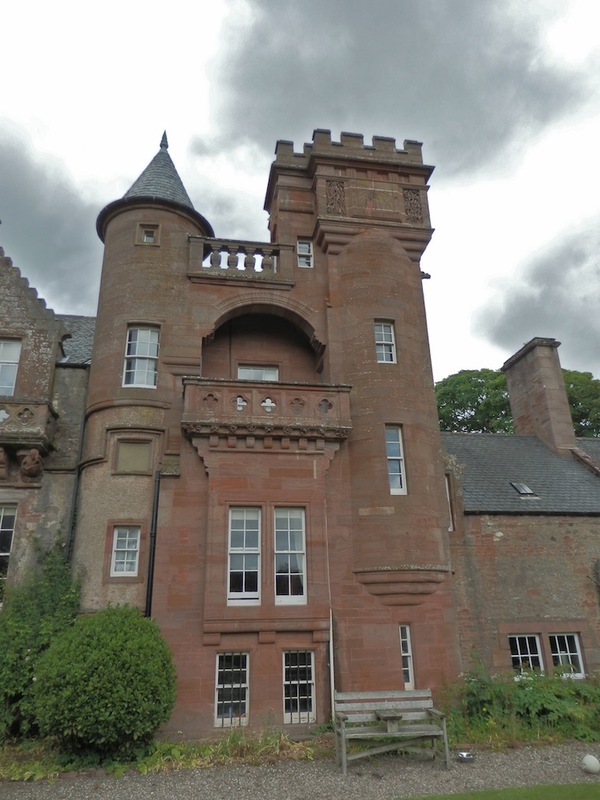 The overall impression is still Hospitalfield-like, though an architect would no doubt draw attention to dissimilarities between the two buildings. There is a cruder finish to this exterior. So that’s clear enough. 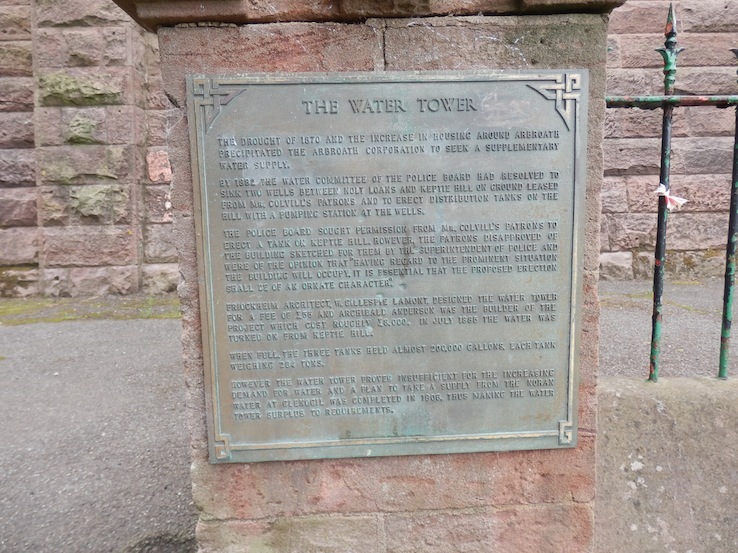 And as the text implies, in the Twentieth Century, Arbroath switched water supplies, taking the town’s water from the huge dam at Glenogil, tens of miles to the north and west of the town. So, the town’s water tower is no longer in use. And Hospitalfield itself takes its water from the mains now. And so the water tower on top of the house is redundant except when made use of by artists-in-residence. 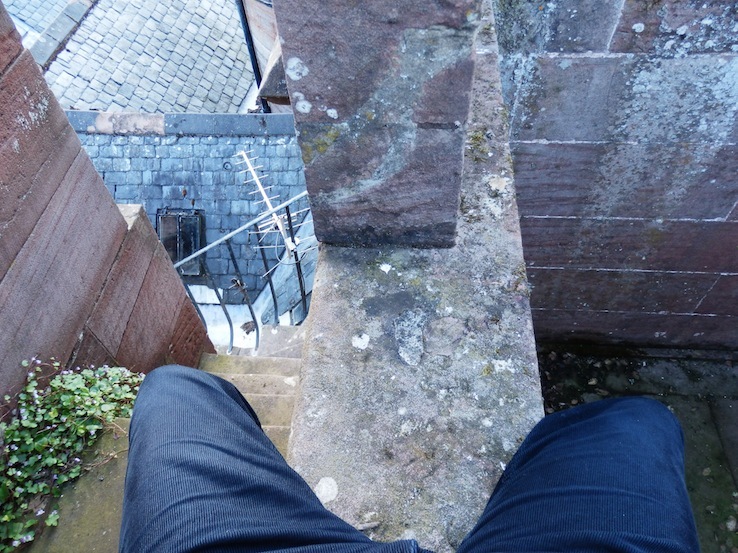 I like to sit up here, on the top edge of the water tower, for a small part of each evening, often with a glass of water drawn from the cold water tap in my ensuite. Usually, I’m on my own, but occasionally Pat joins me, bringing along a bottle of red wine that he urges me to share with him. One night, when I’d just finished the Great Expectations page, we talked at length about Charles Dickens. Patrick and Dickens were born in the same year, 1812. 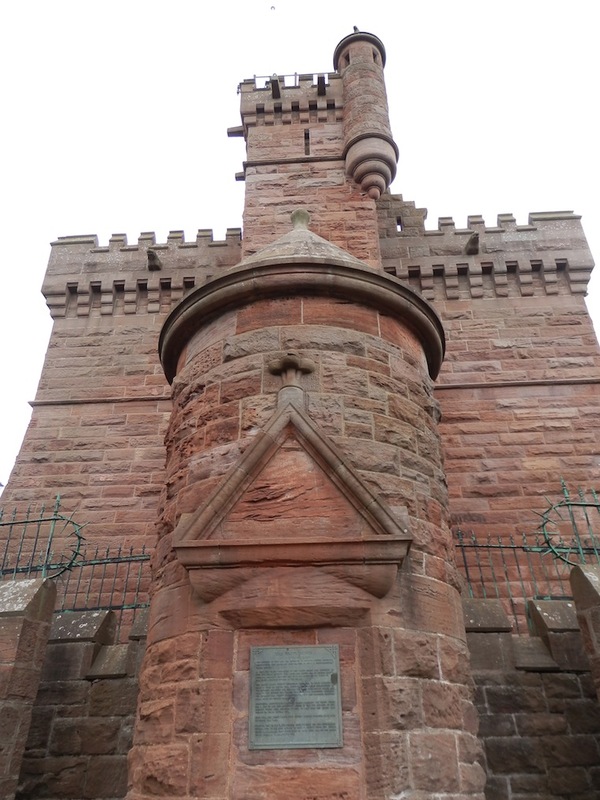 But the summer of 1870, when Dickens died at Gads Hill in Kent, was the very year of Patrick’s greatest triumph: the year that he was able to gift the people of Arbroath a pure and sufficient water supply. “How many glasses of wine would it take to fill the water tower, do you think?” asked Pat that evening, after he’d had a few himself. Pat walked around the perimeter of the tower, making use of a slim ledge that goes around the inside of the space, until he was at the opposite end of it from where I sat. To dye my water green. For wheels of Dundee cabs. At this point Patrick walked towards me, skipped over my legs and disappeared down the turret staircase, asking me to follow him. 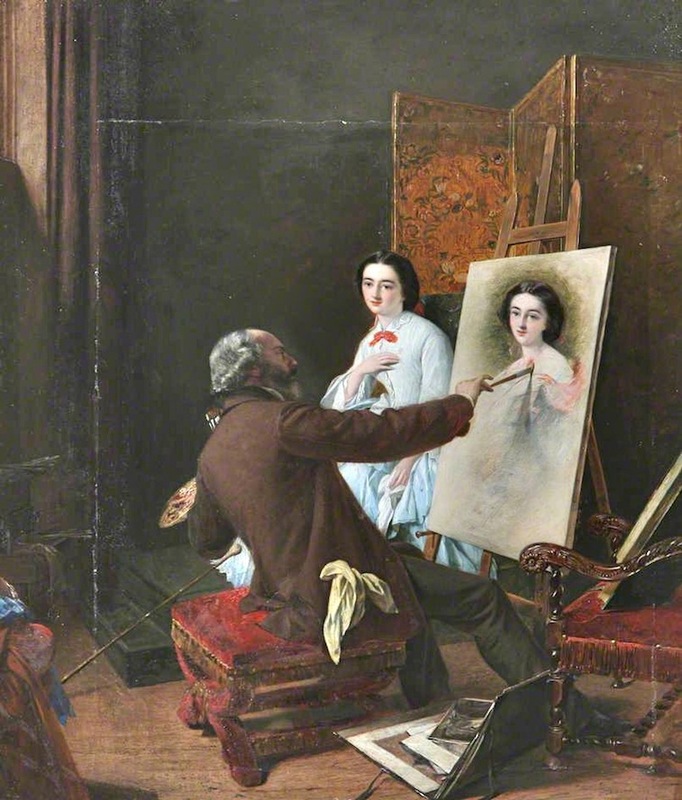 He didn’t stop moving until he was in the Gallery standing in front of the self-portrait of Augustus Egg, that good friend of Charles Dickens. 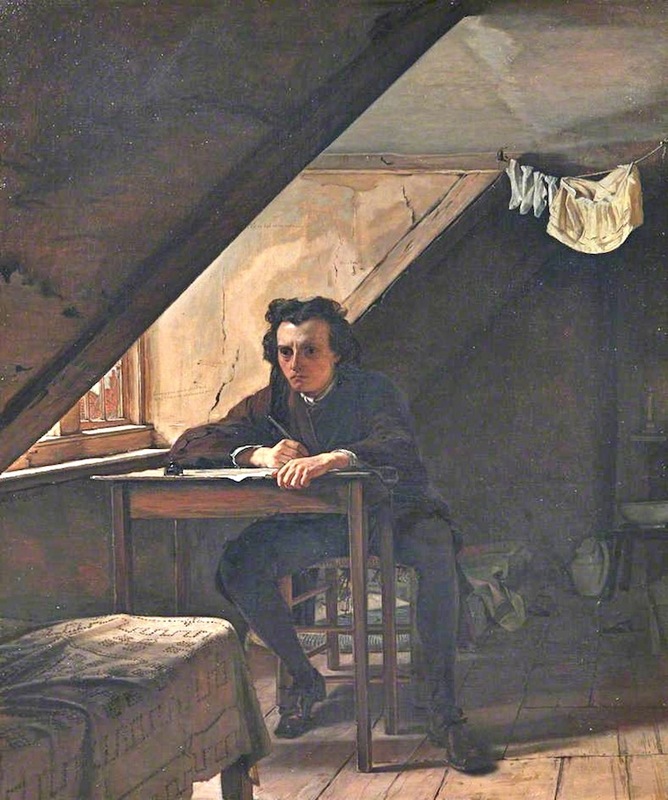 Egg, I reminded myself, died in 1853, five years after he painted his own portrait and seven years before Dickens himself died. “The poem works just as well for dear Augustus, you know,” said Patrick. “Does the poem work just as well for him?” I asked, noting for starters that O’Neil seemed to be rocking his body to and fro. And with that Patrick Allan-Fraser skipped off through the door to the ante room, not to be seen again - by me at least - for a day or two.